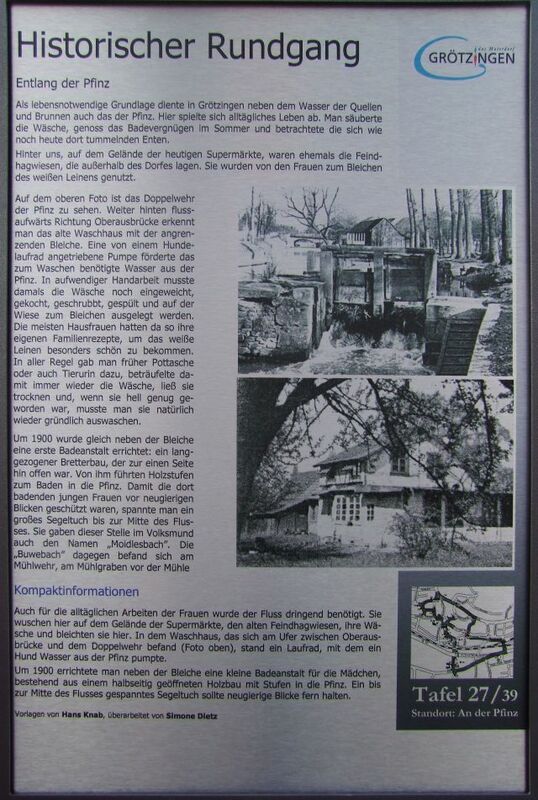 As a vital basis served in Grötzingen next to the water of the springs and fountains also of the Pfinz. Here played from everyday life. They cleaned washing, bathing pleasure enjoyed in summer and looked down as today tummelnden there ducks. Behind us, on the site of today's supermarkets, were formerly the Feindhagwiesen that were outside of the village. They were used by the women to bleach the white linen. In the photograph above the double defense of Pfinz be seen. Farther upstream direction Oberau bridge you recognize the old wash house with the adjacent bleach. One of a dog impeller driven pump promoted the water required for washing of the Pfinz. In handwork at that time had the laundry still soaked, cooked, scrubbed, rinsed and laid out on the grass to bleach. Most housewives had since then their own family recipes to get the white linen especially beautiful. As a rule, they gave earlier potash or animal urine to beträufelte so repeatedly washing, allowed to dry and when it was light enough, you had to thoroughly wash out naturally again. Around 1900, a first bathhouse was built next to the bleaching: a long-drawn Bretterbau, which was open to one side. From it led wooden steps for bathing in the Pfinz. So there the bathing young women were protected from prying eyes, harnessed to a big canvas to the middle of the river. They gave this place also popularly called "Moidlesbach". The "Buwebach" on the other hand was on the Mühlwehr, the mill-race in front of the mill.